Just click on the images below to go to the page with the kind of card game you are interested in. We are starting with Whist games - now with Classic Canasta ,Solo Whist, Bid Whist ,Minnesota Whist, Joker Spades, Poker Squares , Simply Euchre. Recently added Bid Euchre-, Bezique, Pinochle, Buck Euchre and BUM or President. Hot off the press PIQUET - one of the oldest card games in the world. Hot off the Press. Tap/Click image of Bezique in action to download from The Store a one week free trial. 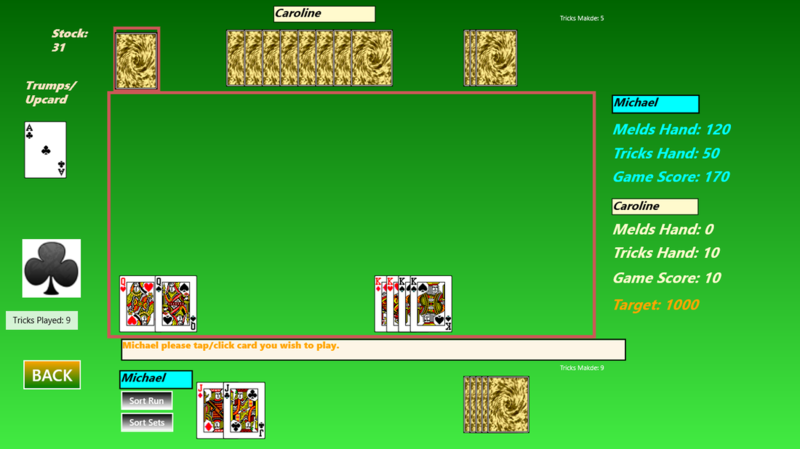 Pinochle in action one meld made and about to make the next. Tap/Click image to go to Windows Store and download a free 7 day trial. Playing Simply Euchre bid to make Trumps Hearts has been made and the first trick is being played. Tap/Click to go to Windows Store and download a free 7 day trial.